Abstract: It's important to note that each core has its own 128KB L1 and 1MB L2 cache; so essentially what we have here are two Athlon64 FX-55's squeezed into one package. On paper and in real world testing, publications have been lavishing praise onto AMD's Athlon64 processors for many a good reason. The benefits of 64-bit computing are real, and high end workstations and servers are already running 64-bit software. The transition at the desktop level has been slower, but with 64-bit versions of Windows Vista coming soon, AMD is clearly on the right path. Intel has a lot of clout over the computer industry, and it has steadily been shifting the paradigm towards parallelism. First via HyperThreading and then with twin processing cores. While Intel pushes forward multiple processor cores, AMD's solutions are still walking circles around Intel in terms of performance! The software landscape for 2006 is shaping up to be completely different from 2005, and the rumors of AMD moving its Athlon64 FX processor line over to dual core are true. Technologically, each companies dual core processor is very different. For example, the integrated memory controller in an Athlon64 runs at the processor clock speed while a Pentium 4/D/XE's bus operates at 800MHz. AMD has a direct 2GHz HyperTransport connection between the CPU and motherboard core logic while Intel systems share data on the FSB which is stuck at 800/1066 MHz. Gamers traditionally require high end components and now nVIDIA and ATi videocard drivers support dual core processors. That doesn't necessarily mean that all games themselves support dual core processors, rather videocard related tasks are now dual core compatible. With the benefits of dual core processors obvious, games should be the first to enjoy the added performance from a second processing core. The new dual core AMD Athlon64 FX-60 processor PCSTATS is testing is based on the Socket 939 form factor, and retails for about $1200 CDN ($1031 USD). Each of the Athlon64 FX-60's individual cores are clocked at 2.6 GHz, which is 200 MHz faster than the previous high end AMD Athlon64 X2 4800+ but 200 MHz slower than the single core Athlon64 FX-57. The processor is compatible with every Socket 939 motherboard on the market although a BIOS flash might be necessary. Make no mistake about it, the AMD Athlon64 FX-60 is the most versatile desktop processor on the market... and as we'll soon show you, just about the fastest too. Like the dual core AMD Athlon64 X2 processors, the dual core Athlon64 FX-60 CPU is physically identical to all 939-pin AMD 'K8' processors and compatible with socket 939 motherboards based on VIA, SIS, ULi and nVidia chipsets. The FX-60 processor PCSTATS will be testing is based on the 'ACB2E' stepping and was built in week 36 of 2005. The Athlon64 FX-60 has a maximum thermal power of 110W, so any socket 939 heatsink built with the AMD Athlon64 X2 4800+ or FX-57 processors in mind will keep the FX-60 running at an acceptable operating temperature.. We'd recommend the Gigabyte G-Power Pro, Arctic Cooling Freezer 64 Pro or Zalman CNPS9500-LED if you're unsure of what to consider. The large 38x38mm nickel plated copper heatspreader of the Athlon64 FX-60 protects the two physical processor cores below which are integrated into a single silicon die. Each distinct processor core operates at a stock speed of 2.6 GHz. It's important to note that each core has its own 128KB L1 and 1MB L2 cache; so essentially what we have here are two Athlon64 FX-55's squeezed into one package. Both cores share a single 128-bit DDR memory controller that operates with dual channel PC1600, PC2100, PC 2700 or PC3200 DDR memory. The CPU-to-memory controller is clocked at the same speed as the processor itself, 2.6GHz, and has a memory bandwidth of 6.4GB/second. The enthusiast class AMD Athlon64 FX-60 processor supports a single 2 GHz (1 GHz up/down, 16-bit wide) HyperTransport connection between the processor and the rest of the computer. According to AMD data, the Athlon64 FX-60 series is being manufactured at AMD's Fab30 in Dresden Germany with the 90 nanometer (0.09 micron) Silicon on Insulator (SOI) process. The silicon die has a surface area of 199mm2, contains a whopping 233.2 million transistors, and is packaged in the standard 939-pin organic micro-PGA form factor we all know and love. AMD's Athlon64 FX-60 processor is rated to run with a default operating voltage of 1.3-1.35V, and has a maximum thermal power output of 110W (at max Icc of 80A). With Cool 'n' Quiet operating the CPU speed can scale back from 2.6GHz to 1.2GHz; consequently decreasing Vcore to 1.1V, maximum thermal power to 46.7W, and maximum Icc to 39.8A. As with all processors in the Athlon64 FX series, the FX-60 is completely multiplier unlocked and supports multipliers between 4-25x. For computer hardware enthusiasts, this should make overclocking much more fun! Team the FX-60 up with an overclocker friendly motherboard like the DFI LANParty NF4 SLI-DR Expert or Asus A8N-series and watch the megahertz fly! 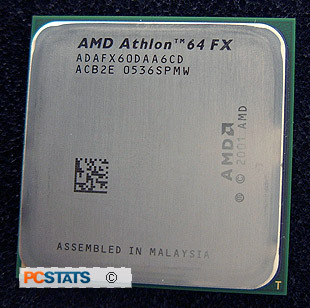 With the release of the AMD Athlon64 FX-60, the single core FX-55 is officially being discontinued. AMD will continue to sell the Athlon64 FX-57 for the time being. Next we'll be overclocking the FX-60 into the stratosphere, but first let's see how it stacks up against Intel's 'Pressler' core. If you would like to learn more about the benefits of 64-bit processors or dual core technology, PCSTATS has gone into depth on this topic in the technology behind dual core processors.